The reviews were somewhat mixed, so I was a little hesitant. But I can say these shoes are super comfortable right out of the box. I'm a teacher, and I wore these all day today without any issues; like walking on marshmallows! No break-in period required. I wish there were other colors available in my size. I would buy them all! I have 20 pair of Cole Haans and never had a pair fit like these. They are very narrow. Could barely tie them! Great feel after a short break in period. Size seems to be a little different than other shoes. I own about 20 pairs of Cole Haan shoes and these are by far the most comfortable pair that I own. This is a very nice looking shoe. Has more of a formal feel to it. Does not look as casual as some of my other cole haans. I would wear slacks with these, not a pair of shorts. Does run a little narrow, but not uncomfortably so. Very comfortable and lightweight. I ordered the blueberry color. recently purchased the same shoe in a different color and LOVED them. I chose these because of the stylist look and seem like they're very comfortable. I choose these shoes because they are our new line and I want to promote them to my peers. Also and most important...Jessica Yost told me, "they rock and the blueberry color is super smooth." How do you pass up on an endorsement such as that. This is innovation and technology!! Awesome Shoes,,,,,,I only wear Cole Haan! How durable is the nylon upper? Does it scuff easily? Thanks! I have had the shoe since it came out and wear them about once a week. 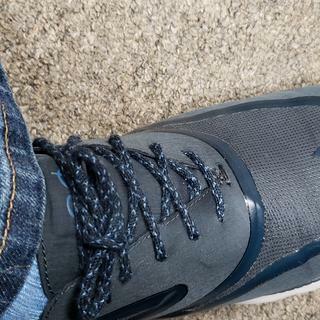 I've had no scuffing and the nylon upper wears well. A very comfortable pair of shoes. It has performed very well. No scuffs at all. I worn them in the snow in Chicago last week and never felt cold. Highly recommend them. Very well made and durable. Worth the money. Approx weight of shoe ? BEST ANSWER: This snazzy oxford weighs .6 lbs., or 9.6 ounces in a size 8.5M. Weight will vary slightly by size.